Will smart devices make us more energy efficient? What is the Best Wifi Smart Thermostat 2017? There is no simple answer that will fit everyone. The answer depends on you. Here is the list of best smart wifi thermostats of 2017 according to your needs. The Inventor of smart wifi thermostat, still on top its game. Great design, easy to use, better savings and ability to work with more devices and software than any other competitor makes Nest the best thermostat of the year. The Nest is the Best wifi smart thermostat of 2017 , It has the best design among all his competitors with a futuristic look, with its shiny metal cover design which reflects your wall color, it matches any wall color you have. It’s the industry leader in its category. It’s no surprise they get the Best smart WiFi Thermostat of 2017, it might not be best in every category but overall it surpasses the competition by doing good in every category. Nest has more product partners than any other company in the list. It connects with anything from to your garage opener to your lights. Even tho it’s not cheap , It has the most rebates and intensives offered by companies. Its programming is unmatched in its category. Click here for our review of the Nest. Ecobee3 is the choice for people with large homes. It’s a very close second to the Best wifi smart thermostat 2017 race. You can place up to 32 sensors in your house to cover everywhere from the movie theater to the bowling alley. It does everything Nest does but with extra sensors. The only downside is the rather long installation and setup process. Ecobee3 is a favorite among Havoc professionals they say it is the most reliable thermostat in the market. The only negatives are the design and sensor effectiveness. Click here for our review of Ecoobee3. It has best user-friendly installation and schedule setup among all wifi thermostats. It’s the ideal Wifi if you are not good at doing things yourself. It’s not a learning thermostat and Sensi has some connection issues from your phone. It does what it spouse to do with no problems & it’s the cheapest wifi thermostat on our list. Click here for our review of Sensi. If you are the type of person who likes a large Touchscreen where you can see all the information on one page and don’t like dial system of Nest, this is the thermostat for you. If you get it installed by a professional, you will get a 5 year of warranty which is the longest in the market. Honeywell is an 110-year-old company, you should have seen the iconic round type model before, they know a lot about HVAC systems but no so much about software development. It’s price and effectiveness make it the best touchscreen wifi thermostat out there. Click here for our review of Honeywell RTH9580WF. If you like to buy the newest gadget in the market and like Honeywell products, this is the thermostat for you. It comes with most of the features that competition has with a much better price. The design a step forward but the new software is a giant leap for Honeywell brand. It’s so much better than previous Lyric models, it’ s a crime to name the device a Lyric because of the bad reputation old models had. Click here for our review of the new Honeywell Lyric 5. Ecobee3 lite is a godsend for costumers who are looking for a budget option to get a wifi thermostat. It has most of the features Ecobee3 has minus the sensor, people tracking and support system compatibility. It’s better than Nest second generation, which is 25% more expensive than this one. Ecobee 3 lite is a strong contender for Best Thermostat 2017. Click here for our review for the new Ecobee3 lite. LUX WIN100 is our pick for the best wifi thermostat, great for people who wants to heat only one room instead of the entire house. Low price and great quality of the product makes it best in its category. Click here for our review for LUXWIN100. Are you trying to lower your carbon footprint? Do you want Peace of Mind? Are you living in a large or small home? What is your budget? Are you living alone or with a large family? Do you value comfort or saving more? Do you find the new wifi gadgets too complicated and want something simple? Everyone has different answers to these questions. That’s why I categorized wifi thermostats in the market according to your needs. There are hundreds of wifi thermostats for sale in the market. They all do the same thing at the end. They save you money and let you control your thermostat wirelessly. But they cater to different audiences because they have vastly different features. Off course, nobody has time to check out all the thermostats in the market. That’s why we reviewed most of the thermostats in the market for you. We have all the information you need about wifi thermostats on this site. Our buying guide covers everything from decision making to installation and much more. Why Best wifi smart thermostat 2017 reviews? It all started when my wife called from home. She said, “I got bad news, thermostat not working again”. This was the third time the old thing broke down on us, so I had to find a thermostat replacement. Our old programmable thermostat was a great brand but it was 20 years old. I started reading about thermostats online that same morning at work. I must have spent the whole day reading. During my research, I found out that smart thermostat industry exploded in the last few years. Gone are the days of 2 major brands in the market. Nowadays there are hundreds of wifi thermostats to choose from. I have read close to 30 different smart thermostat reviews before deciding. I ordered a thermostat with wifi online. I know WiFi thermostat sounds weird to some people when you first hear about it. But these new gadgets are a lot more than just a programmable thermostat. They are becoming complete home control computers as time goes by. They connect to other smart devices in your house and create a bridge between them. You can control all aspects of your home automation needs. When I told my wife that I am going to install it myself. She said, “Honey I know you want to do it yourself, but if we spend another night without a thermostat I might lose it.” . She was right, I am not good at DYI anything. Despite the ultimatum, I went ahead and installed it myself under 15 minutes. I was a hero, my wife was smiling and clapping with joy and in return that made me happy. So I wanted to share this with others. The best thing about it is the price. I have mine for over a year. I purchased it with a rebate from my electric company and it saved me $110 on my electric bill a year. This number is the average among WiFi thermostat users. I have not changed my heating or cooling habits, the machine did it by itself. The convenience to able to control your thermostat by using your phone from anywhere is great. I wrote my first review as a blog post since then I collected & wrote more reviews about other models as well. I decided to create this list of best WiFi thermostats for those who are in the market to buy a new WiFi thermostat. Why did I really buy a smart thermostat? It was not for the features; they are awesome don’t get me wrong. These gadgets have great features, they got sensors, software, and tons of bells and whistles. They are beautiful, I just like looking at it on the wall and I think, that looks awesome. It’s not for the benefits either; They have amazing benefits too, they are affordable when you factor in the savings, rebates, and incentives. Hell, they are free in the long run. I like the fact I am wasting less energy. I love waking up to a warm house in the morning before I go to work. Arriving a warm office during the day, and when I get back home It’s warm again. Without wasting energy when I am not home. They are integrated with all other “internet of things” in the house. I can give a voice order and my house will dim the lights in the living room, lock my doors, turn on Netflix and set the temperature to a comfortable degree. But all these features and benefits fade off my radar as time passes by. My thermostat looked awesome when I first got it, I used to stare at it and check every little detail. But nowadays, it’s just another gadget I have. I used to love the monthly reports I get, explaining my energy usage and how much I saved. But I rarely look at them anymore. Despite all these fading feelings, there is still a big reason why I would buy another one in a heartbeat as a gift. The real reason why I bought a smart thermostat is peace of mind. Peace of mind is an interesting concept. The moment when your mind all silent, you are laser sharp focused, nothing is clouding your mind. You are in the zone; sports people will say. I want that in my life, as much as possible. This is very important for me, I don’t want to worry about my utility bill. I want to be comfortable in my house. I don’t want to return from airport to turn off my thermostat on the way to vacation. I don’t want to think about anything that I don’t need to think about. My heating and cooling should not be something I think about in the 21st century. Does this make sense? I think too much as it is. I don’t need to add extra thoughts in there. I have no control over it that’s for sure. My brain just randomly puts thoughts into my head all day long, just like everybody else. The only thing I can do is to not create unnecessary thoughts by worrying these little things. Peace of mind is the real reason I bought my wifi thermostat. Check out my list of Top 10 Reasons to Buy a Smart Thermostat. The list goes into depth about what makes smart thermostats Unique. First of all, you have to check your current thermostat and see if it’s programmable or not. If it’s not you should replace it, it’s not even a debate at this point. Because it will pay for itself in energy savings and rebates in a year. You will keep saving 15% on your energy bills on average after that. You will also reduce your carbon footprint and help to slow down the climate change. If you already have a programmable thermostat, you should learn to program it and set up a schedule for weekdays and weekends. You will save money some money; you will be able to live a comfortable life if you stick to your strict weekly routine. For a basic lifestyle, your old programmable thermostat should be enough. But if you want to save more money and you also want the extra comfort you get with all the extra features by having a smart thermostat installed in your house, you should get a new smart wifi thermostat. Studies show smart thermostats save more money compare to programmable thermostats. You will be able to control your thermostat wirelessly from anything with an internet connection. You will satisfy your home automation needs to the fullest. Check out my detailed comparison Smart vs Programmable Thermostat here. Can you install a smart thermostat? The second most important thing before you buy a new thermostat is to see if your thermostat supports your system. Power off the heating and cooling system, it’s usually located in the breaker box. Take off the thermostat cover and check if there are any DANGER signs. Check to see if there are L1 and L2 cables going into your thermostats. If there is a danger sign on the box or L1 and L2 cables are connected, or there is a label reading saying 110VAC, 120VAC or 220VAC, these are thick black wires with wire nuts; you have a high voltage system. If your system is a high voltage system, you can’t install these smart thermostats. You will need to get an HVAC professional. If you don’t have any of these indications, congratulations you can install a new smart thermostat. If you are still confused, check out our guide on How to Identify your Heating and Cooling System with pictures by Clicking Here. There are two types of programmable thermostats. Depending on your heating and cooling system, you either need a line thermostat(110 to 240V) or low voltage thermostat(24). This website is about 24V thermostats. Line thermostat installation is for Electric baseboard systems or Multivolt systems. Check our guide above identify which one you need. I recommend hiring a professional for line thermostat installation. Low voltage thermostats are named according to their scheduling capabilities. For example,5-1-1 means you can set a schedule for weekdays and 1 for Saturday and 1 for Sunday. Other models called, 5+2-day, 7-day, and smart wifi thermostat. You can find detailed information about Different Types of Programmable Thermostats here. A wireless thermostat—also called a WiFi thermostat, smart thermostat, digital thermostat or Internet thermostat. The best WiFi thermostats might contain sensors which control the heating and cooling systems within houses, apartments or businesses. A WiFi thermostat works with your heating, ventilation, and air conditioning (HVAC) system and can be adjusted from a remote location. These have almost unlimited amount of schedules, you can set 24 different schedules a day if you want to go crazy. They all come with different features, software capabilities and design. There is also smart thermostat for portable space heaters. If you live in a small house or alone, and you don’t want to heat the entire house for no reason. You should get a portable heater or A/C thermostat. These devices plug into your wall socket and you connect your heater to them. It has all the basic features of a programmable thermostat has. LUX has cornered this market, their products are vastly superior to the competition. Which brand of smart thermostat should you buy? Nest, Ecobee, Honeywell, and Emerson are the Big 4s of smart thermostat industry. They all come with different software, installation, and design. Most of them have identical basic features but vastly different extra features. You should stay clear of the other brands in the market at this moment. There are hundreds of brands coming in and out of the market, every year and most go out of business within few years. Stay away from the unknown and most of the Chinese brands as well, they lack proper customer support and they have security issues. If your new thermostat doesn’t allow you change factory login and password settings, stay away from them. If your device lets you change it but it won’t ask you to set a password when you first install the device, make sure to set a new password but we wary of the device. Because the best thermostats would ask you to set a password and login name when you first try to install the gadget. Not buying a smart thermostat on the basis of privacy and security is like being against smartphones 10 years ago. Your cell phone and your computer are connected to the internet all the time and yet most of the people have one. The only way to hack into a smart device in your house is by getting inside your house and physically touching the device. If you have a firewall and set up your own password for the device you shouldn’t worry about hacking. If you are still concerned about your thermostat connecting to cloud check out our post about Privacy and Security here. How much should you spend on a thermostat? The thermostat market exploded in the last 4 years. The demand for smart thermostat has been increasing every year since Nest released its first smart thermostat, Nest first generation. It was revolutionary at the time and they owned the market from 2012 to 2013. Current situation of the market is much more balanced, with other major brands producing smart thermostat very competitive with Nest. If you only have a hundred dollars to spend you should really wait until you have more money to spend on a new thermostat. Because at that price range, it’s not worth to buy a wifi thermostat. Some states offer up to 100$ rebate or tax credit on these devices. At 160$ price range, there are a few good thermostats in the market. These thermostats are usually older generation models or models with features stripped from them. Like the Ecobee3 vs Ecobee3 lite, one has sensors you can place in your house the second doesn’t even have the option to get sensors. At around $250 you can get one of the best thermostats in the market. With rebates, incentives and saving you should really aim this price range. 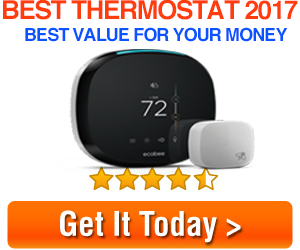 You will get the greatest value at this price range for money spent on a thermostat. For the $350+ price range you will have the latest technology and innovation thermostat market can offer at the moment. You can get multiple sensors, better software and all the bells and whistles you want. Nest vs Ecobee vs Honeywell vs Emerson? Each thermostat company has the same basic features. You can connect them wirelessly, set up schedules, adjust the temp in the house or turn it off after you leave the house. What makes them unique, is the extra features that come with it. For example, Ecobee has sensors, Sensi has a very good app, Nest pioneered the learning thermostat market and Honeywell has a history of 120 years . If you are still confused about which brand to buy, or want to compare one against another. You should check our detailed reviews for each model above. We explained the differences between them under the guides. We have done a detailed comparison of the major brands in the market. Check the Smart Wifi Thermostat Comparison here. Replacing your old thermostat with a new wifi smart thermostat is easy for 90% of people. It took me 10 minutes to install my first smart wifi thermostat years ago. I simply removed the old front plate and unplugged the wires. I installed the new smart thermostat and attached the new wires. But I had a simple conventional furnace system. After moving into the new larger house with a dual system, installing a new thermostat was more complicated. It had a lot of extra wires and the wiring was not standard colors. It took me much longer to figure out the installation. I researched this topic extensively, I created guides about anything related to smart thermostat installation and wires. Check out our How to Install a Smart Thermostat Guide here, if you want to take a look the installation process. I tested the thermostats listed below for a year for Nest and Ecobee3, and a few months for the rest of the products, except the new release models Ecobee lite and Honeywell Lyric T5. We compared our utility bill compare to the year before without the thermostat to compare the savings. I called the companies to check their support team and inquired about identical problems. The savings mentioned in the reviews are the product of following strict cooling and heating guidelines set by the department of energy. If you set your temperature too high during winter or too low during summer, these thermostats will not save you any money. None of the reviewed thermostats was given as gifts. That’s why there is no disclaimer saying that we were gifted these products in return for positive reviews. There are multiple brands that we gave up on after less than a week of use. Those brands are not mentioned in this article. You can check our review section for our wall of shame.